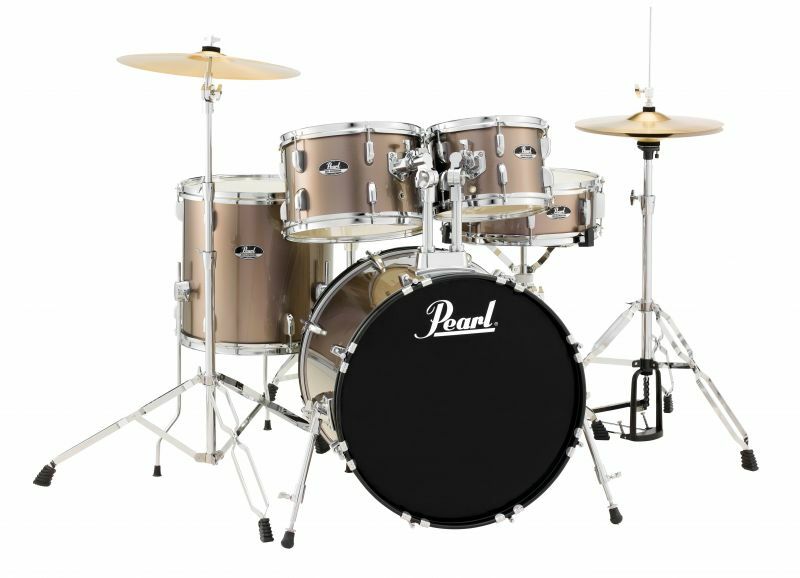 This Pearl Roadshow 5 piece kit comes with Pearl cymbals which Includes a 16in crash/ ride and 14in hi hats. Also with a Pearl drum throne, double braced cymbal stand, hi hat stand, snare stand, dual chain drive bass drum pedal and 2 x pairs of sticks. Sizes are 10in x 7in & 12in x 8in rack toms, 14in x 14in floor, 20in x 16in bass and a 14in x 5in matching wood snare. Colour is in charcoal metalic wrap. The Pearl Roadshow is a complete drum set package with everything you need to start your rhythmic journey to the big time. The cymbals, hi-hat, and snare stands should start with a strong and well-balanced tripod base. Double-braced legs and interlocking tilter adjustments are also vital for keeping all parts of the kit in place under the pressure of performance. Roadshow's included hardware package is second-to-none in its class. All stands are dual-reinforced, height and angle adjustable, and feature double-braced legs to withstand the pounding onslaught of the heavy-hitting drummer. The snare drum is the voice of the drum set and captures everything from the loudest accents to the softest "ghost" notes. With a matching shell and finish, the Roadshow snare is full of attack and power, yet sensitive enough for drumming at any volume. The bass drum is the tonal heartbeat of the drum set and should not only set the low-end pulse for the groove, but be a foundation for the rest of the complete drum set-up. The Roadshow bass drum features an extended tension/tuning range for low, chest-thumping bass frequencies, and includes locking, slip-free feet (or ‘spurs'), and secure mounting for toms and accessories. Roadshow's included cymbal set features a 16in brass crash/ ride and a set of 14in brass/hybrid hats.